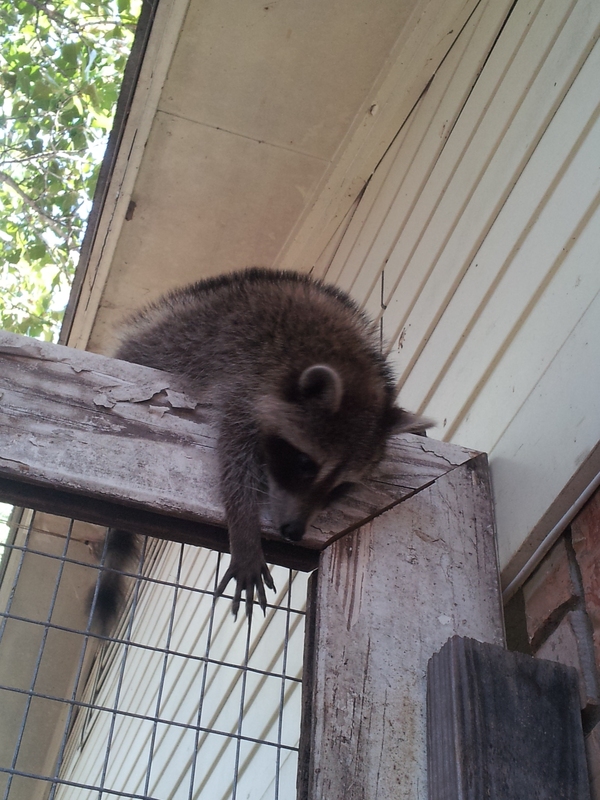 The Wildlife Center at Crosstimbers Ranch official blog | A glimps into the world of wildlife rehabilitation…the world through a rehabber's eyes. Sometimes, Mother Nature’s “Plan B” needs a Plan B…. Well, followers, many of you are fans on our facebook page…you just come here for the more in-depth scoop of the goings on here at the ranch, huh? Well, we have some very exciting events happening right now, and we could not be more pleased, and sad, and thrilled, and humbled all at the same time! We rehabbers could be described as a buffer between the natural (and in my opinion “real”) world and the ever advancing industrialized consuming machine that is modern human “culture”. We are celebrators and worshipers of nature, and the amazing things it provides and creates. We are the wild ones, the ones that cannot exist without nature, and find the thought of the absence of nature devastating. We speak for and defend the voiceless ones. We could never imagine being able to counter-balance our top-heavy world-wide carrying capacity, but instead strive to soften the impact, ever so slightly. Every life we touch, every person we impact, every animal we hold in our hands, is one more chance to do something amazing and good. Ultimately, our goal is to educate humanity of the importance of moderation, stewardship, and responsibility. Our goal is to bolster the wild creatures and ensure their footing in our future world. Ultimately, our deepest desire is to share these stories with the world, and return these creatures to the wild world where they belong, and where they fit most perfectly. Often, we are successful. Often, we see our goals come to fruition. Sometimes…well, sometimes we end up with beings like Cheeze. Sometimes, these guys just get too missguided through misinformed human intervention to remember how to fit back into their perfect wild world. This, my friends, this is one of the bitter sweet moments in our calling. This is where we mourn for individuals like Quincey (his story can be seen as an earlier entry here on our official blog) who must now spend their days in human captivity rather than fulfilling their destiny as one of the wild ones; uninhibited and free. Just like we as a species have always sought the silver lining in every dreary cloud, we rehabbers have perfected the art of “plan B”. This bitterness does not come without sweet moments when we realized that though this may not have been Mother Nature’s plan, all is not lost. It now becomes our duty to ensure that this wild one’s life is not without meaning or purpose. We take these unique individuals, and we find a world that fits them. In the process, we are presented with a very unique situation that carries with it the utmost gravity. This creature, this very special, perfectly designed creature now takes on the position of a teacher. He may not know the gravity associated with his newly created position in life, and even those that come to see and marvel at his beauty may not know (at least in their conscious mind) how important this one, singular creature has become. This one marvel, this one amazing creation represents hundreds and thousands more of his kind (and others) that are battling for survival…fighting, struggling, defending their right to exist. People may come in the hundreds to get just a glimpse of this elusive, magnificent creature…hundreds more may completely ignore him. But it just takes one. One person to be impacted by the mere presence of the creature in front of them…just one person who’s imagination was lit afire, who’s heart awakened and realized what this singular creature stands for…what nature has been screaming, crying, and trying to tell him through the eons. Humans are not a separate existence from the earth. Without our earth, we do not exist. Each plant, each animal, each microbial existence in the soil beneath our feet is essential to the well-being of our earth. Our home. Crosstimbers is absolutely honored to have a part to play in impacting that one person. Today, as of this writing, three of our most memorable cats are headed to new homes. New lives, and new responsibilities of the utmost importance. Today, Crosstimbers wishes safe journeys and wonderful new lives to our three ambassador graduates. We want to share and savor this new beginning with each and every one of our fans and followers. Cheeze, Ollie, and Yoda graduated from Crosstimbers today, and are now on their way to new lives as teachers…All three of these wonderful kitties are headed to the National Zoo in Washington D.C.
All of the staff members here at Crosstimbers are so excited for these guys. They have all been wonderful teachers to us here, and now go on to continue their work impacting hundreds more in their wonderful new home. Good luck, and safe journey Cheeze, Ollie, and Yoda! Queso – a tough rehabbing case! Did we spell it wrong? No, Cheeze was originally a “Q” in the alphabet, so he was initially named “Queso”. He was such a unique cat and his name just didn’t fit him. He was so funny and such a ham, that the name “Cheese” seemed to fit him better and it eventually evolved to “Cheeze”. Cheeze has a sad, but certainly not uncommon story. He came to us from another rehabilitator in the Houston area. This particular rehabber, athough very talented with a multitude of wild species, and who has a stellar reputation received Cheeze as a single kit. She did not know we existed and did not know how incredibly hard it is to raise bobcats to be returned to the wild. Almost any rehabber who has made this mistake will only make it once. Cheeze grew up somewhere between imprinted and having wild instinct. She handled him just enough for him to like being around humans, but not enough to make him “handle-able”. Not having any previous experience with this species, and with no access to anyone who truly specializes in working with bobcats, this rehabber made the all too common mistake of releasing Cheeze WAY before he was ready. At just six months of age, Cheeze just did not have the emotional fortitude or experience to survive on his own. Bobcats, in the wild, stay with their mothers until they are at least 10 months of age. When they go through rehabilitation, a rehabber must commit to care for these animals for a minimum of one year, because until then, they are emotionally just little kittens. They do not know how to care for themselves, but more importantly, they do not have the emotional capability to do much more than chase and play with anything that moves. Learning that it must hunt and kill things to survive does not occur to them until they are at least a year of age. This rehabber felt they were doing the right thing. Not knowing of anyone else in the United States that works with this species, the rehabber decide to release Cheeze on their private property. He stuck around. Played outside, ran to find people when he saw them, and ultimately, when he could not feed himself, turned his frustration, hunger, and aggression towards people. People had always been his food providers. He could not understand why they were not bringing him the things he needed to survive. We agreed to take Cheeze in, knowing that he had severe behavioral issues, and knowing that there was a good chance of injury to one of our many skilled handlers, however, we understood that it was no flaw of his that prompted his aggressive behavior. He was acting the way he had been “programmed” to act, and for that, we could not fault him. What we have learned about bobcats is that when imprinted, they want to please, they just don’t always know how. Cheese was one of our toughest cases. He was highly food aggressive and would startle easily. All trust for humans was gone. However, since bobcats have an intrinsic desire to want to please, Cheeze set about trying to build trust, and after several years of love and dedication, he is a happy, healthy, respectful young man who has just been put on to our adoption list and is scheduled to go to the National Zoo in Washington D.C. in mid-January. It is our greatest joy to know that an animal as beautiful as Cheeze will live a long and happy life being an ambassador to the world in one of the finest educational facilities in our country! Bridgette came to us in 2008. Her family surrendered their “pet” to us at four months of age. Once they discovered that wild animals can act aggressive at a drop of a hat, especially with those who are not trained in animal behavior, they made the decision to bring her to a facility that would understand her, and give her appropriate care and interaction. Although Bridgette is a very sweet cat, like all bobs, she can throw a fit like nobody’s business. She was a funny kitten who had us laughing all the time. She could eat more food than any adult on the property. She would literally gorge herself until she was miserable. These pictures were taken one night after she had finished dinner. It was a night that I will never forget. It was almost like she ate herself drunk! This was a progression of pictures over about 30 minutes. She was watching me from a chair while I worked on my computer. When I got up, she moved to my chair and made herself at home. In 2010, Bridgette contracted viral encephalitis; a pathogen transmitted by mosquito bites. This aggressive disease can have lasting effects. In Bridgette’s case, this resulted in some neurological swelling and though the damage to her brain was not severe, she will always have some lasting effects. Most notably, the small circles she walks when she is out of her comfort zone. We try to protect all of our animals from diseases like encephalitis, West Nile Virus, Lyme disease and other insect borne diseases, but they still slip through on us. Sadly, Animal facilities will not adopt an animal with any outward damage because visitors are constantly notifying staff of the cat’s “health issue’. Although Bridgette does not have a future with a zoo or other wildlife facility, she does have a permanent home with us. Most facilities would be required to euthanize her because she cannot be adopted and cannot be released to the wild. Lucky for Bridgette, she has a great future here at WCCR. By making her part of our surrogacy program (being a cage-mate to multiple cats), she has a valuable place with us for the rest of her life. Should a suitable home ever come along for her, she would be considered for another location, but it would have to be the right facility with the right handlers as she is a special needs cat. She is bonded to only a very few of the staff who spend time with her. She takes a while to get to know, and to understand, but once she trusts you, it is an unbreakable bond as anyone who works with her will attest to. Bridgette is a healthy non-aggressive girl and a wonderful cage-mate for most any new cat. She suffers from Flea allergies, so we have to take extra precautions during flea season. She gets along with almost everyone, which is unusual, so her job here is to help acclimate new cats to their cages, getting them used to living with new cats and making their transition to new zoos who already have another bobcat in their enclosure much more tolerable. Bridgette is a dual purpose kitty here at WCCR! She is one of a handful of our cats that are a part of our research program. She is one of three “vocalizers” that we have on-site at the moment. A vocalizer is one of the seven personalities that we have identified who have a tendency to “talk” about everything. Our other vocalizers, all of whom you will meet in the near future, are Zachia and Peter. Over the last couple of years, WCCR and NBRR have grown to an incredible size. We now have more cats on the property than ever before, and the numbers keep growing! We have great people working with us, but need sponsors to help us with funding so that we may keep pace with the demand, and continue to grow! If you would like to help care for Bridgette, please visit our website and make a donation today! We cannot do this alone. We are seeking individuals to sponsor each of our cats with a monthly donation! It is imperative for us to move in this direction if we are to continue to provide for special needs cats just like Bridgette, and the many others that currently call our facility home! ANY amount helps! For us to continue to take these wonderful cats in, we MUST find sponsors and support. Are you our next one? 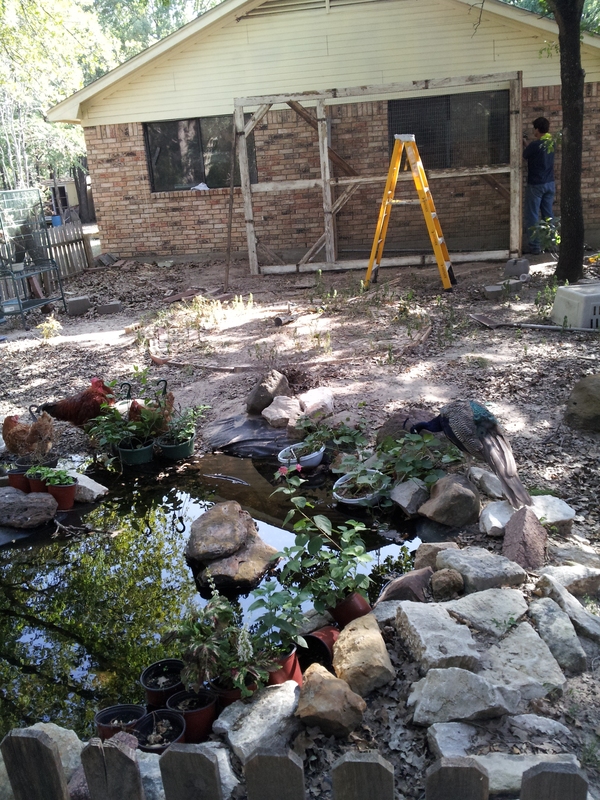 Keep watching for updates on even more Crosstimbers Cats! Meet Brave Braelyn. This tough girl has been through alot, and still has a long way to go! We need your help to help her! For such a young kitten, Braelyn has had a tough life. It is very clear to us that her mother was either killed or trapped and taken away. We know that there is another kit out there that the landowners are now trying to trap so that they may be reunited. As previously mentioned in our preface, bobkittens stay with their mothers until they are at least 10 months old. When their mothers are trapped and taken away, they must fight to survive. Braelyn has clearly had more than a few battles. She came to us with her poor nose nearly missing and several deep lacerations on her little body. She is only about 16 weeks old. Who she has been battling with remains to be seen, but who/whatever it was, it was much bigger than she was. She is grossly underweight, so has, obviously, struggled to find food and we pray that we can find her sibling before it is too late. 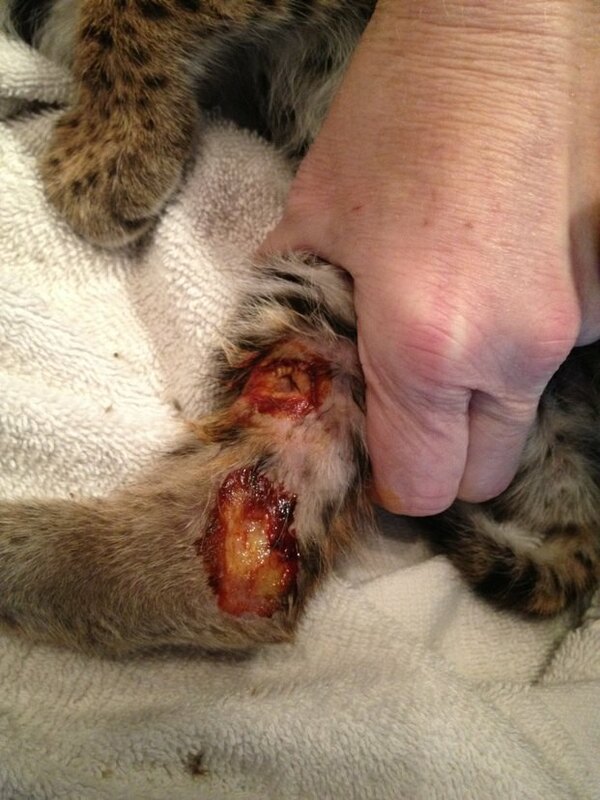 Her lacerations had become infected and she was very weak when she first arrived. But there is good news! As of two days ago, she had regained enough strength to crawl up into her hammock which hangs from the top of her ICU enclosure! She had previously been unable to get up off of the floor. She has been eating well and gaining weight every day. We continue to hope that Santa Paws will help us to find her sibling, but without further funding, we cannot hire someone to go out and assist the landowners in trying to capture it and get them back together. If you can help, please go to our website or use the link on the side column of this blog, and donate today to help Braelyn get back on her feet and help us to hire one someone to help put what is left of their family back together. Braelyn’s future is still uncertain, but we continue with positive thinking, her undying wild spirit gives us high hopes for her to be released back to the wild sometime mid-summer next year. However, this special girl will need a lot of expensive intensive care in the weeks and months to come if she is going to make it. She will be paired up with others of her age once back on her feet. If her sibling joins us, they will remain together for the rest of their time here at the ranch and be released together back to the wild where they belong and on a property where they will never have to worry about being trapped, hunted or displaced. All our kitties want for christmas is somewhere safe to call home. Will you help them? Now, Don’t fall over in shock, but this is Val. As most of you know, Dawn started our Facebook page years ago, and thankfully, Kari picked up where she left off and expanded our page to include a blog. As much as I would love to be entrenched in social media, I have neither the time, nor the know-how. However, I have been overwhelmed by the Christmas Spirit this year and wanted to make a special effort to take the time to give you the updates you have been asking for! And, because the Christmas spirit has grabbed a hold of me, I am going to take it a step further and give you a gift! From now until the end of the month, I am going to give you a short bio on ALL of the cats that are currently in care at the center! And, I would like to ask all of you to add your stories, comments and experiences, if you have any, with each of the cats or at the ranch, as they are discussed. There is a reason for this. WCCR & NBRR have grown in leaps and bounds. Because most of our friends are not local, most have no idea what is going on out here. We want you to know, and to SHARE with others, the GREAT work we are doing. We also want to give you updates on the new outreach and policies we have set in place. First, and most important, NBRR decided, two years ago, to branch out from native wildlife and begin accepting confiscated or unwanted (turned over) imprinted Bobcats. 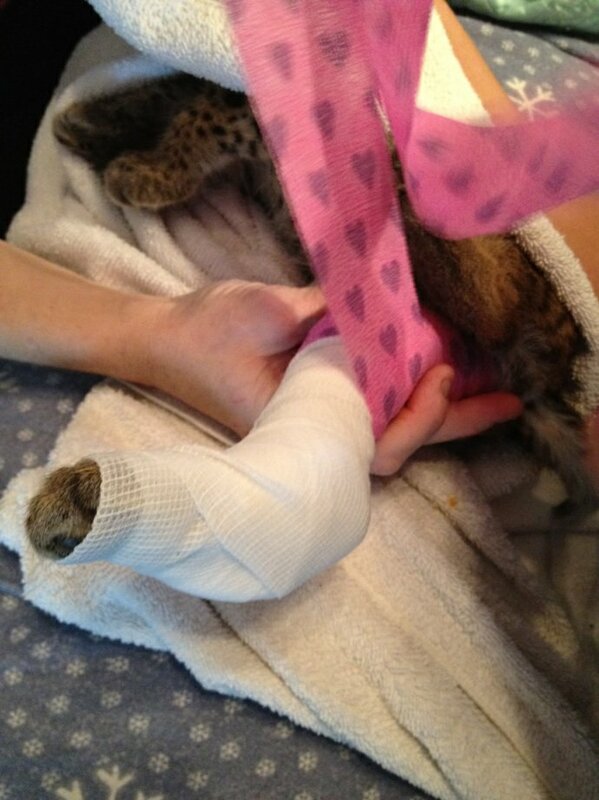 We quickly became the largest bobcat rescue in the United States. We are now proud to announce that we have been asked to be the first bobcat rescue to be utilized by the AZA and to be listed in their studbook! The AZA studbook is where AZA accredited Zoos and Aquariums turn to find breeders to supply their facilities with replacement animals. This is VERY exciting because, due to our rapidly growing national reputation, they contacted us! We will now be able to accept, train, and supply imprinted bobcats that might otherwise be euthanized due to lack of space in exotic feline rescues. Of course, many of these cats come to us with severe behavioral problems. Our behavior specialists are some of the finest in the country! Special Kudos to Kari and Deborah for their exceptional work and dedication to these very special cats! So, where to start? My goodness! Alphabetically, I presume, would make the most sense. Since we began this new program, cats have poured in, so you will get to hear stories about bobcats that you have never been introduced to before! And, because we have more cats than we have days left in the month, we will have to double up on most days and give you one in the morning and one in the evening! Yes, We’re THAT busy! Unfortunately, that means a HUGE burden on our dwindling funds! Since we know that you didn’t know, we are hoping that you will share these stories with everyone in hopes that we find enough donations to pull us through another (exceptionally busy!) winter. We hope that if you read a story that you enjoy, or that touches your heart, that you will cross-post it so that we can increase our friend base and hopefully find some corporate and/or private sponsors that we still so desperately need. It is important to note that our first love continues to be the thousands of native wild animals, including wild bobcats, who come to us for help each year. The imprinted cats are entrusted to our care and are donated by us to other non-profit educational facilities. Our work here is critically important to the future understanding of the increasing population of urban bobcats and we continue to operate on a completely volunteer staff. We cannot do this alone. Please remember these beautiful animals during this holiday season and throughout the year because the next well adjusted and happy bobcat you see in a zoo throughout the United States may be from The Wildlife Center at Crosstimbers Ranch. God Bless you all and Happiest of holidays from all of us at Crosstimbers! A preface to our introductions. Bobcats come and bobcats go around here. Some stay for a few weeks, some stay for years. Much depends of their ability to be released back to the wild, whether they have medical or behavioral problems, whether those problems are temporary or permanent, and how old they are when they arrive. Each cat is given an identifying name. We start alphabetically each year. When we reach “Z”, we begin again. Any bobkitten brought to us who has not already been imprinted is slated to be returned to the wild after it has reached one year of age; adults and juveniles who are not imprinted must also be at least one year old before they are released back to the wild. The reason for this is because in the wild, they will stay with their mother until they’re at least 10 months old and, literally remain kittens, emotionally, until they are at least one year old. In an urban environment, they will stay with their families even longer, sometimes for life! Should we try to release them prior to one year old, they do not thrive and often end up being returned to us by some unsuspecting stranger who found a starving bobcat on his property. Though the years, we have leaned to avoid this by making SURE that our cats are emotionally ready to be out on their own. We strive to ensure success as a “rewilded” animal for every creature that comes through our doors. But most, especially our beloved bobcats, are incredibly intelligent; and we must diligently strive to ensure that we do not damage their wild potential by allowing an overabundance of human interaction in their space. Our work has led us to discover, so far, seven different personality types in bobcats. Each is as distinguishable as day and night. Some personality types are more easily imprinted than others. It is with those that we must be the most careful. Others want nothing more than to be wild from the day they arrive to the day we watch them run across an open pasture to live their wild lives. There is nothing more gratifying than to release a cat back to the wild, yet, many can never go back. Why? To answer this question, we must revisit the issue of the level of intelligence that these incredible cats posses. These cats could easily survive in the wild, yet, they are so smart, that one they have become imprinted, they recognize where food comes from. Many of them seek affection. When an imprinted cat is released, it will seek out humans and approach them. This ends up badly in 99% of these cases. They are often shot or trapped and euthanized because they are “acting strangely”. A few of them make it to us. Generally, they are the ones who have collars on and have escaped from a home. The percentage rate of an imprinted cat, as best we can figure, is only about 5%, and that is ONLY if the cat is release onto a private protected property where there are no hunters or humans to ruin their chances. Therefore, with the imprinted cats, we work closely with them to be very sure that they will be happy in a facility where they can be a liaison for their wild brothers and sisters. As we introduce you to our current cats in care, we want you to clearly understand that our main goal is to return them to the wild, and that when that is not possible, the next best thing is to ensure a happy life with handlers who will give each cat what it needs to live a long and happy life with people who love, respect and care about these beautiful animals. We are always happy to answer questions from anyone, so please, if you have any, let us know. We always want the best for our charges, and when the obvious best is not attainable, then we seek the best available. We hope you will enjoy reading about our work and support us in any way you can! Each year, we struggle with naming certain alphabet letters – and this year is NO different. We will start out our alphabetical stories with “Angel-Face” who was named after she arrived with her two brothers and one sister. Angel-Face was EASY to name. As often happens, she became highly stressed when she first arrived, quit eating, and became very sick. She lost a lot of weight, so we had to pull her away from her family to get her back on her feet. While she was separated, we named her Angel-face because she was SO curious about everything we did. She would hide in her cat box, peek over the edge and would get the sweetest look on her face when we confused her by doing our “Human things”. We ultimately cave her a cat box full of blankies that she could hide in while sneaking a peek at our antics. She remained separated for about three weeks while she gained weight and her strength back. Her brothers and sister were dubbed “X, Y & Z”. They are STILL named X, Y & Z! They are strong and sassy! They talk and play constantly, but the MINUTE they see a human, they all run for cover into the nearest crate or box. We are hoping for your help! Will you all PLEASE help us name these other kitties? Please post your ideas below. Human baby names have all already been used, so we want to ask you to make up unique names, for example, last year’s X, Y & Z were named Xylan, Yoda, & Zachia. So be creative! We need your help! These little ones arrived when they were only 5 weeks old. I am afraid that we do not have many pictures of them as we wanted them to stay wild and therefore did not/do not approach them very often. I took this picture the other day while hiding behind the couch. You can see that they are all very bonded and will, likely, stay together long after they are released. Their mother was trapped and relocated before anyone realized that she had babies. At about 4 weeks of age, and barely walking, the little ones started peeking out of their den, one at a time, looking for their mommy. They were hungry and frightened. They were caught and brought to us over a period of several days. All are finally doing really well. There really isn’t much more to say about these guys except that they are all doing as expected and staying on track to be released, growing like weeds and staying wild! This is our only large litter, so will be the only time you will get an update on multiple cats at one time. Don’t forget to help us name X,Y & Z! Thank you to all of our wonderful supporters who contributed to our critical needs baby! Your support was overwhelming, and wonderful!!! We have almost reached our funding goal for this little one! Of course, our goal will only cover part of his medical care, so any and all help is graciously welcome! Thank you to all of our amazing, wonderful, incredible readers and supporters for everything you do to help us return these wild babies back to their world! Ulyses may get to taste freedom yet, and it is all thanks to our unbelievably amazing supporters! You guys are the BEST supporters any non-profit could ever ask for! THANK YOU! You, and you alone make what we do here at WCCR possible! 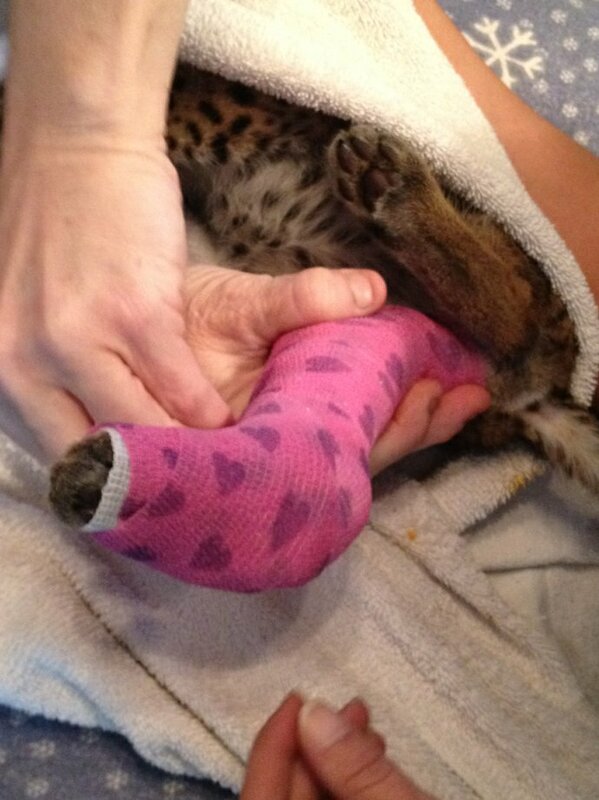 The Wildlife Center at Crosstimbers Ranch has received a very special guest that urgently needs your help. His name is Ulyses, and he is only ten weeks old. He has been separated from his mother and siblings, and the poor little guy has suffered some serious trauma in his short life. Ulyses is a bobcat, and he already has a special place in the hearts of all of the staff members here at WCCR. You see, at this tender age, he has had a little altercation with a dog…that resulted in a compound fracture of his leg, and massive infection. This poor little wild one is terrified and alone, and he can’t even yet have a buddy to comfort him. For now, until his condition improves a bit, his stuffed animal is his closest companion. 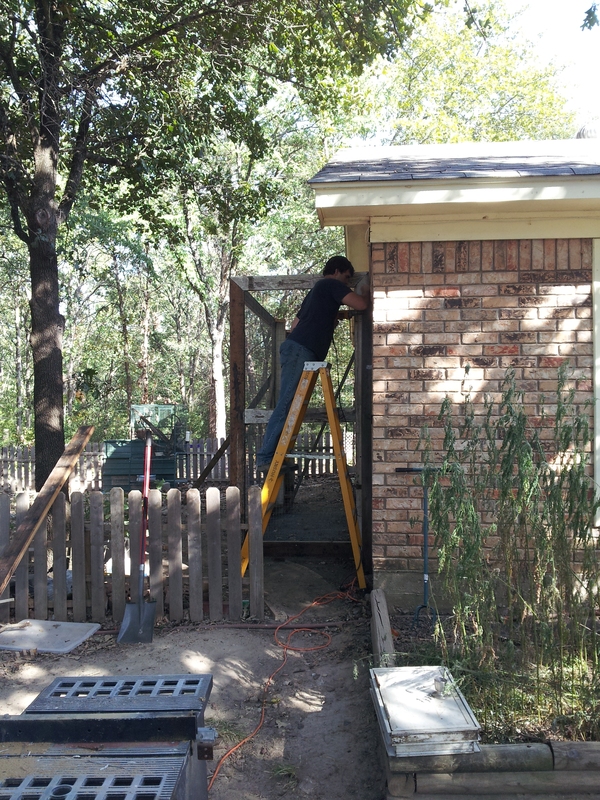 Here at Crosstimbers, we do 90% of our medical treatment on site. There are many reasons for this that I may go into in some future blog, but for right now, my main focus is to help this little one return to the wild. But in order to do that, I am going to have to solicit some help! To rehab a single (healthy) bobcat from kitten to release, costs more than $2,000 and over 12 months in feeding and maintenance alone. Any medical treatment or other operational care all comes at additional expense. For Ulyses, the cost will probably be more than double that figure. His tiny leg will be set in his heart emblazoned cast for at least the next six weeks, and he will need some heavy-duty antibiotics (as well as other medications) to battle the massive infection. Supportive care will also include a special immune system supporting diet and eventually, physical therapy. Little Ulyses had to be sedated for this procedure, so once his cast was secured, he was placed in isolation to recover from anaesthesia. His ongoing care, rehabilitation, and physical therapy are going to be major hurdles for WCCR this year. The economy has put a squeeze on us all, and we are definitely feeling it. We are trying to raise $500 towards his ongoing care, and every cent helps. 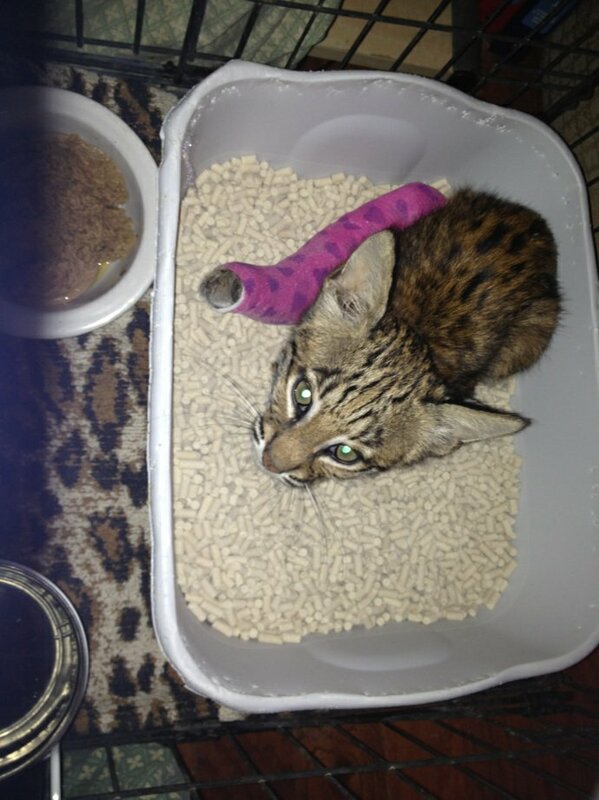 If every person who read this blog donated just ten dollars, that total sum would mean a massive step towards going back to the wild for this amazing cat! Every bit helps! If you want to be a wildlife hero, click on that donate button on the right hand column! I know we can do this. Lets get Ulyses back to the wild, together! As you may or may not know, Theo, our little starlet, has always had a difficult time living outside. Well, to be honest, Theo has always had a hard time! He has had so many close calls and near misses in his short life thus far, that it should come as no surprise that our little guy with such a delicate constitution would have a hard time adjusting to life outdoors. 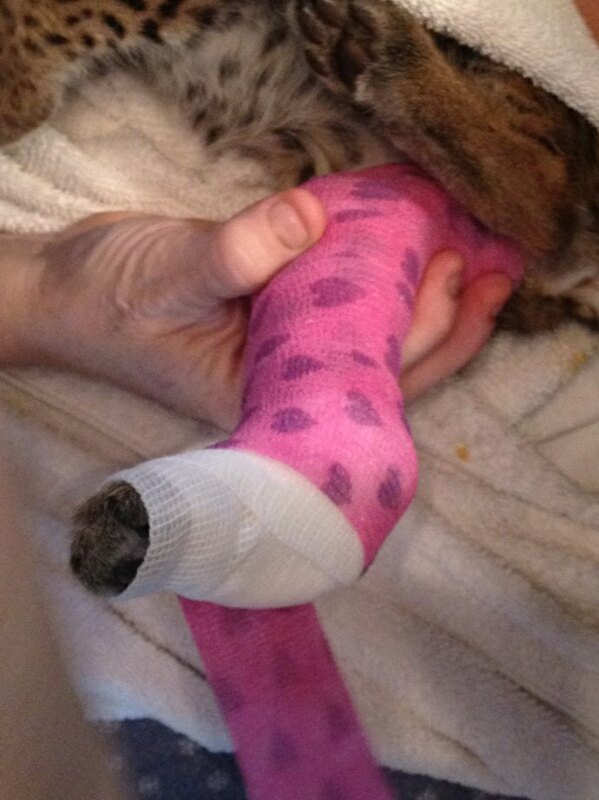 At a certain age, it just isn’t very feasible to keep a bobcat inside. For our wildlife center, we keep our baby bobs indoors till a certain age. Just as a mother bobcat would keep her kits in their den, we keep them inside the nursery. Bobkits are quite sensitive, and need close supervision to monitor health and well-being. After they pass that certain delicate age, and they begin to grow more adventurous and rambunctious, they begin their slow transition to outdoor living, usually in preparation to becoming wild again. Theo really is no exception, other than he would never survive release. Alas, our attempts to transition him to outdoor living were exceedingly stressful to his delicate constitution, so, he was moved back indoors for his health and safety. 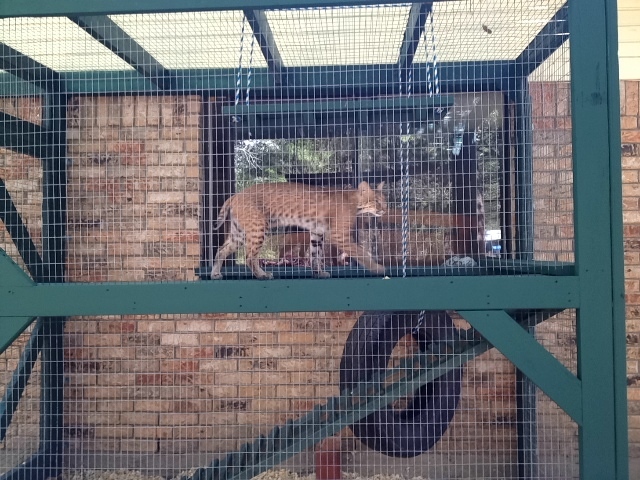 The one problem with this scenario is that Theo is now an energetic young bobcat, and Crosstimber’s indoor enclosures are not really suitable for longterm residency…mostly, it is our nursery, and our ICU area for our invalid residents. Neither one suits Theo any longer. 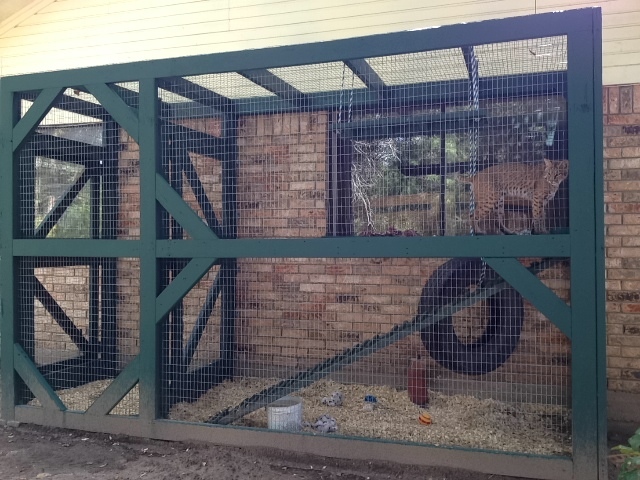 So, our director came up with the idea to create an indoor/outdoor enclosure for Theo. This would give ranch staff the ability to keep a close eye on Theo, and also provide him with the space he needs. One of our awesome staff members designed and built a wonderful enclosure for Theo. 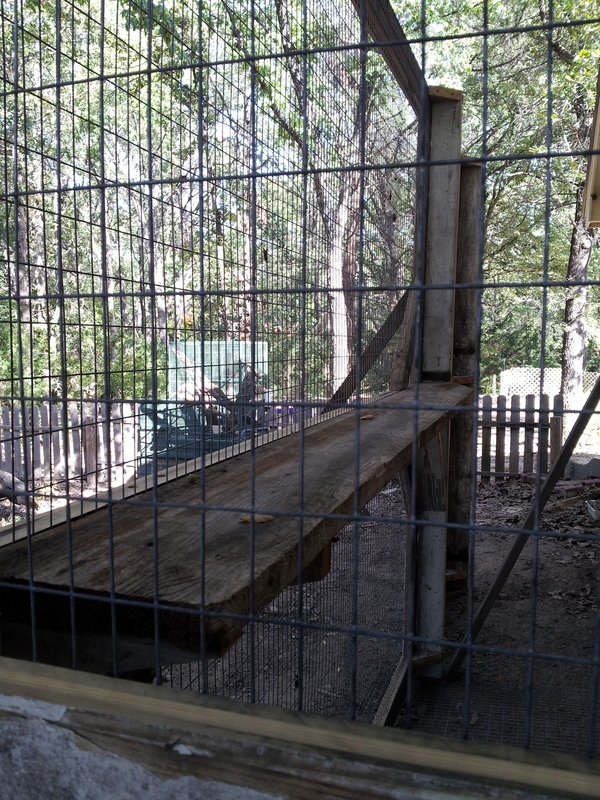 And of course, in true Crosstimbers Wildlife fashion, the entire thing was built out of reclaimed lumber. It was specially selected and designed for Theo’s comfort, and has a great view overlooking the turtle garden! Once it was complete, it was painted a lovely shade of green, and Theo was out exploring it in no time! That is the face of one happy bobcat! Do you remember little Willow? That super cute baby opossum picture from the previous post? Well, she has two roomies now, and her little enclosure was getting quite cramped. So last night I moved the three little opies to a new, bigger, airier enclosure. Complete with fresh blankies, bedding, and snazzy new water bottle so they would quit tipping the bowl! What I didn’t account for was tenacious little Willow, and the three relatively large doors at the front of the cage! Now, little Willow has always been quite tenacious…for an opossum…and there certainly has been no exception lately…while my two newbies cower in the corner piled on top of one another (safety in numbers and all that jazz), Willow is strollin every inch of her new digs…and noting every weakness in it’s defenses! From 7 this morning till now 10pm, it has been a non-stop game of hide-and-seek with her! Three times she got away, and on that third trip back to the nursery, I secured those doors down with bread ties…or so I thought. I walked through to get myself a snack, looked down at my opie nursery, and realized I was an opie short again! Sure enough, Willow had slipped away…for the fourth time. 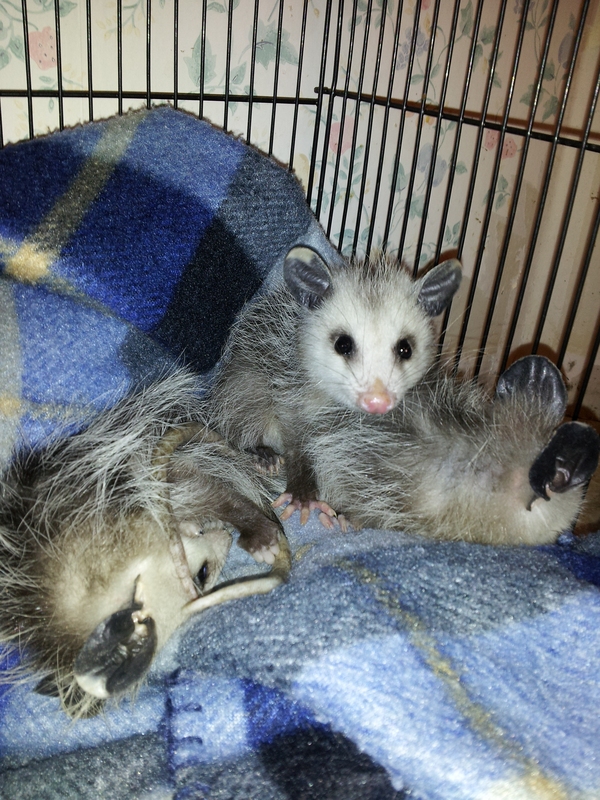 I paid it no mind…she quickly makes her whereabouts known…opossums are not renowned for their stealth mode, you know. However, hours passed, and still no sign of my little rogue. 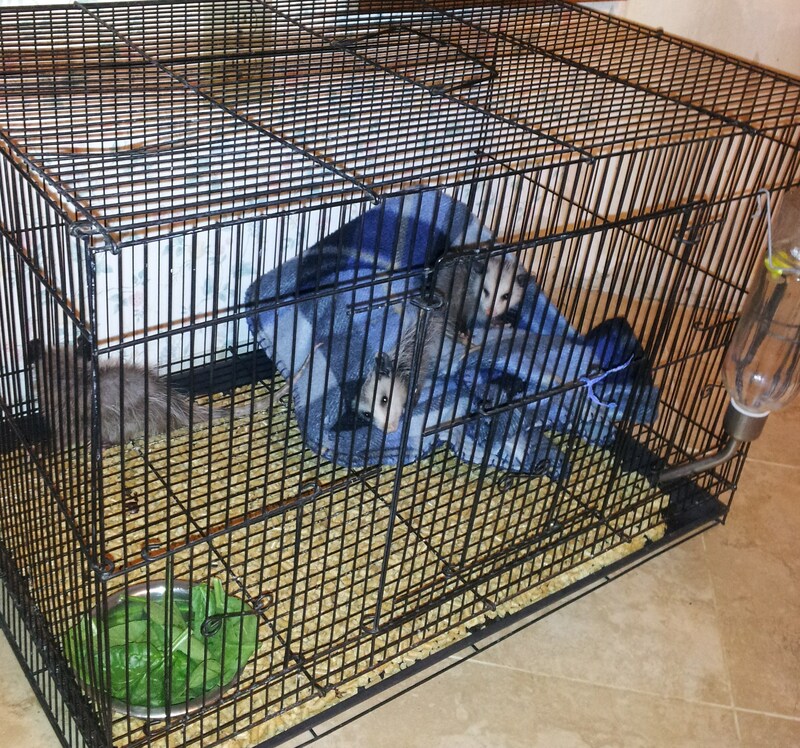 Opossums being predominately nocturnal, I always wait till late in the evening to feed them. Fresh food makes happy tummies! :)…and keeping a schedule is a good way to get in some behavioral conditioning! Like clockwork, I went to feed my wee wards. As I reached down to grab their bowl, the third little set of beady eyes I had been searching for all day peered up at me from the corner of the room as if to say “well, it’s about time you brought me my dinner! Where have you BEEN? !”.